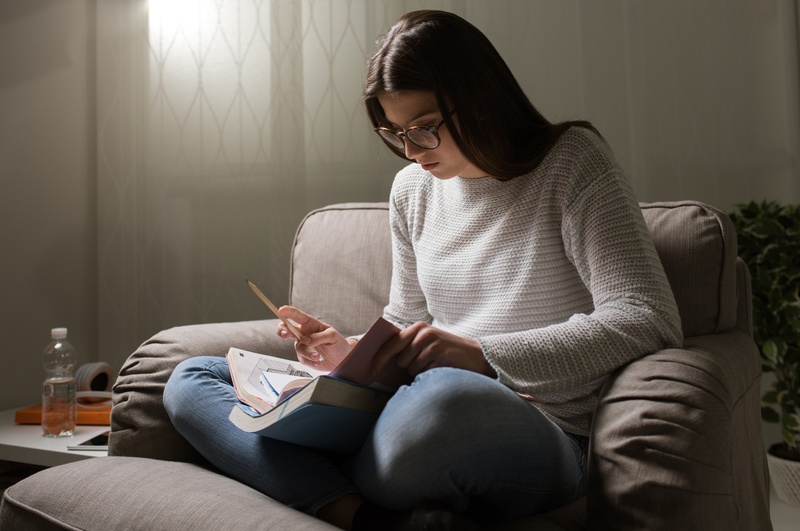 Many students find Sufficient Assumption questions to be among the most difficult on the LSAT. They are relatively with common, and students should expect 2-4 per exam. While they are not the most frequent question type, they tend to eat up a large amount of students’ time. However, with the right strategies, they become much easier to solve. Here are three examples, all from LSAT 70. The Messenger won’t interview Hermann. We are clued into this by the “So” that begins the last sentence. More often than not, especially in LR pre #15, the conclusion will be the last sentence of a stimulus. The biggest pitfall students fall into is not focusing on the logical gap between the reasoning and the conclusion – we need to add an assumption that allows a conclusion to properly be drawn. Therefore, we need a crystal-clear understanding of why evidence given is insufficient to reach a conclusion. This is the core challenge of these types of questions. The Messenger won’t do anything that its editors think would compromise its integrity. Hermann wants to approve the interview before publication. We should immediately be thinking of logical gaps between the evidence given and the conclusion reached – that is the core of the logical reasoning subjective question. The question asks us to prove the conclusion. The way to answer sufficient assumption questions is to arrange the evidence, find the gap, and add a new premise that lets you draw the conclusion. Here, conditional logic is key, but this will not always be the case. It is important to abbreviate the stimulus for yourself when entering it into conditional logic notation – try to keep track of as little as possible while maintaining the premise-conclusion relationship in your head. Mastering conditional logic is key to success on the LR section, but even more so the Logic Games (Analytical Reasoning) section. We’ve already identified the gap before we even moved to the answer choices. Sufficient assumption questions usually lend themselves to a strong pre-phrase, though not always. CORRECT. Hermann wants the right of approval. 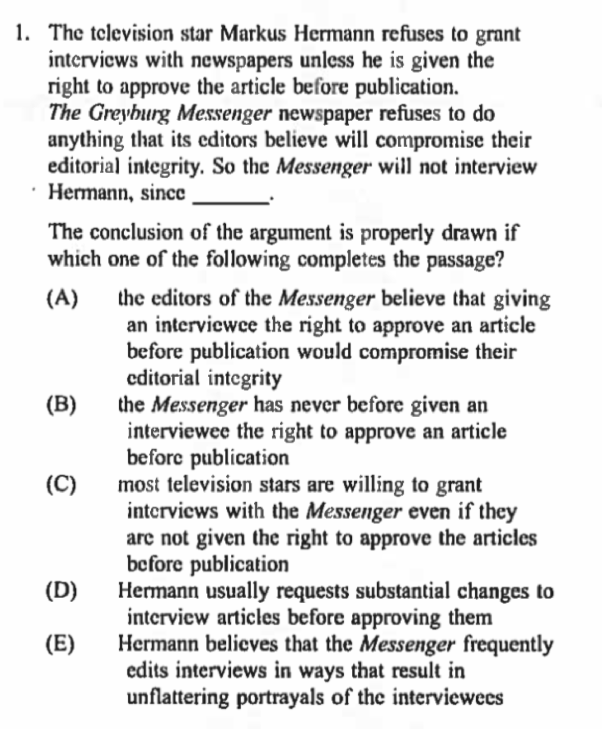 This answer shows that the editors think that would compromise the Messenger’s integrity. And the editors don’t do anything if they think it will compromise integrity. The past doesn’t guarantee the future. Sure, the editors have never given approval before….but they might change their minds. This is an example of the LSAT universe being quite different from real life. In the LSAT, you largely have to divorce past actions when thinking about future claims. This tells us that most TV stars are different from Hermann. So what? This answer doesn’t tell us that the editors will deny Hermann’s request. We know exactly one reason that the editors will refuse to do something: if they believe that an action compromises their integrity, they won’t do it. It’s not clear that the editors believe substantial changes will compromise their integrity. This explains why Hermann wants the right of approval. But it doesn’t prove that the editors will reject his request. The biography does not explain what is of most interest about Shakespeare. Be careful to track exactly what pronouns mean – never allow “it” to enter your conclusion – always note what “it” stands in for. The conclusion is based on the premise that. The premise is about a biography failing to explain what made Shakespeare "different from his contemporaries;" the argument then shifts to a conclusion about failing to explain what is "of most interest" about Shakespeare. These two concepts aren't the same. We need an answer choice that links them. In many Sufficient Assumption questions, the key to success is to understand the "new concept" in the conclusion—a concept that isn't supported by the premises. The correct answer connects the premises to that new concept. We can often eliminate answer choices because they don't address the new concept in any clear way. (A) Premise Booster. This answer choice might explain why the recent biography doesn't explain what made Shakespeare different. However, this doesn't guarantee a relationship between what made him different and what is of most interest about him. (B) Detail Creep. 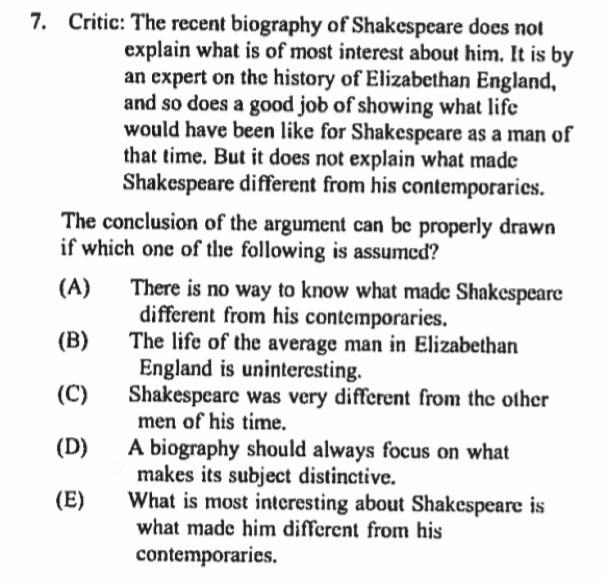 Choice (B) is about the life of the "average" Elizabethan man. What does this have to do with Shakespeare? The premise tells us that he was a man of that time. Does it tell us that he was "average?" No, it doesn't. (C) Premise Booster. This supports the idea that Shakespeare was different, as is already suggested in the premise. However, like (A), this does nothing to guarantee a relationship between what made him different and what is most interesting about him. (D) Premise Booster. This indicates that the biography should have explained what made Shakespeare different (distinctive). But again, this doesn't show a relationship between Shakespeare being different, and what is of most interest about him. Premise boosters and detail creeps are classic wrong answer choices on sufficient assumption questions. It is very important to remember that LSAT Logical Reasoning questions get considerably more difficult as you move through the sections. Expect the last 7 questions to take you twice as long as the first 7. As with any assumption family question, we first distill the core. Here, we have some conditional logic yet again. Looking at our premises, we have one fact and one conditional. Since both of them have to be true (because they are given to us in the stimulus), and the fact triggers the conditional - that means the result of the conditional must be true as well! So, combining these two statements, we properly conclude that most large dairies won't meet the federal standards. The combination of statements in the premises allows for a logic games like deduction – don’t be afraid of treating conditional LR problems similarly to how you would LG problems. Notation is optional – try it out for yourself. Some students love notating LR sections, whereas it confuses others. The conditional relationship means that if the premise is true, the conclusion is guaranteed - that fulfills the job of a sufficient assumption! (D) matches this classic pattern perfectly: IF (most large dairies won't meet the fed stds on waste disposal) THEN (most district water = likely to become polluted). This will guarantee the conclusion from the premise! Both (A) and (C) are examples of faulty contrapositives of this basic conditional. 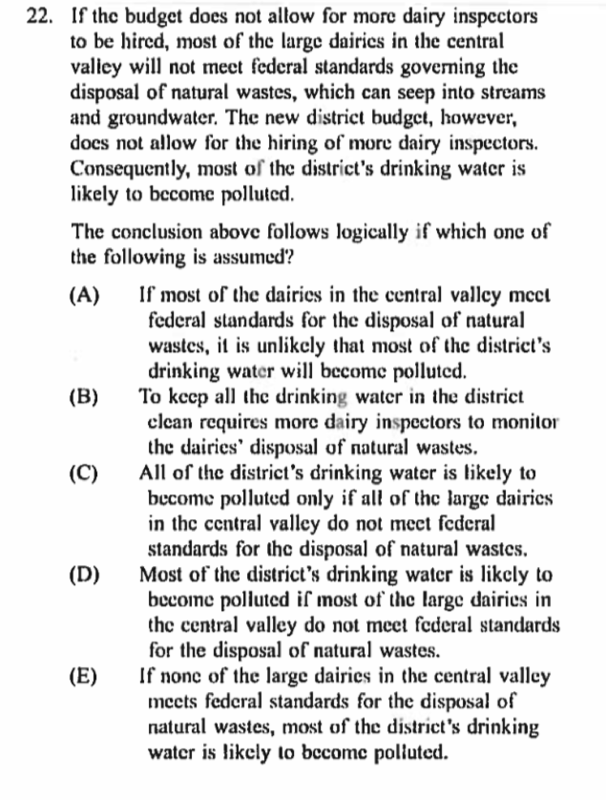 (A) IF (most dairies meet fed stds for waste disposal) THEN (most district water = UNLIKELY to become polluted). This is called an illegal negation. This negates both the trigger and the result of the conditional that we want. Our argument is about a world where most of the large dairies do not meet the federal standards - this answer choice tells us something about a world where most of them DO. (C) Remember that "only if" translates to "then"! So the conditional is: IF (all district water = likely to become polluted) THEN (all large dairies do not meet fed stds for waste disposal). Illegal Reversal. This format is IF (conclusion) THEN (premise). We needed to get from the premise to the conclusion, not the other way around! (B) and (E) are wrong for other reasons. (B) If this were true, then the fact that we can't get more dairy inspectors would mean we cannot possibly keep ALL the drinking water clean. So, at least some drinking water will get polluted. But that doesn't guarantee that MOST of the drinking water will get polluted! (E) This gets to the right conclusion! But it only guarantees that conclusion if NONE of the large dairies meet the federal standards. We don't know that's true. The premises only tell us that MOST of the large dairies won't meet the federal standards. This conditional never gets tripped by our evidence! Are you interested in connecting with a LSAT tutor?